economic resilience. Innovative water system implementations. Micro-pollutants, asset management, ICT & data, desalination. 3 november 2017: The Conference of the Amsterdam International Water Week (AIWW) resulted in the signing of nine Amsterdam Agreements. The agreements express the intention of many leading companies, institutes and authorities in the water sector to jointly collaborate on a wide range of challenging issues on the global water agenda. Changing the way we look at our water-related risks – finding new approaches – is something that cannot be achieved overnight. Case owners, experts, suppliers and investors who signed an Amsterdam Agreement, pledged to continue their work in the coming years until they have reached their goals – in order to achieve real breakthroughs. Signatories will report back on their progress during the Amsterdam International Water Week 2019. One of the Amsterdam Agreements involves the Human Cities Coalition by consultancy firms Arcadis, Witteveen+Bos, Fugro, SWECO, research institute Deltares and multinational AkzoNobel. This coalition signed a Memorandum of Understanding (MoU) to join the UN Roadmap for Human Cities, improving the living conditions of informal populations in slums in Manilla, Jakarta and other megacities. This and many more impressive Amsterdam Agreements were signed during AIWW this week. The Nine Amsterdam Agreements that were signed: Human Cities Coalition; Berliner Wasserbetriebe and Waternet; Blue Deal: safe water for 20 milion people; Waternet and Hofor Denmark; FMO – NWP: develop and finance international water initiatives; Water in the Circular Economy (WiCE); Living with the sea; Allied Waters, AquaMinerals and KWR: Upscale water resource recovery; and WaterWorX. Human Cities Coalition and Arcadis, Witteveen+Bos, Fugro, SWECO, Deltares and AkzoNobel signed a MoU that sets out an action agenda for inclusive urban development. The Roadmap lays out a long-term strategy to effect a systematic transformation in water infrastructure investments by working closely with key stakeholders towards the inclusion of social and human components in procurement design. This will remain in effect for eighteen months, during which signatories will share knowledge and expertise on a pre-competitive basis to develop a collective vision and action plan to integrate inclusivity. Berliner Wasserbetriebe and Waternet, both utilities that operate in an urban environment agreed to cooperate on three specific topics: how to abate contaminants of emerging concern (pharmaceuticals, plant protection products, industrial contaminants, personal care products) in the water cycle; how to cope with extreme weather events due to climate change in an urban environment; how to cooperate in an international context in international and European research programs like Life and Horizon2020. All 21 Dutch regional water authorities and the ministries of Foreign Affairs, Infrastructure and Water, Economic Affairs and Climate will set up an international program (Blue Deal). With the programme the parties aim to improve flood protection, the accessibility of water and the water quality worldwide. Blue Deal combines the national policy of three ministries with the hands-on implementing power of the Dutch regional water authorities. These authorities want to share their expertise in regional water management with countries that face similar challenges. In addition, the Dutch water authorities believe that Blue Deal will increase their ambitions to contribute to a safer, cleaner and healthier world. On World Water Day 2018, Blue Deal wil be finalised and presented. Netherlands Water Partnership (NWP) and the Dutch development bank FMO signed a Memorandum of Understanding that aims to develop at least two water initiatives, from project development to financial closing stage. The role of NWP focuses on mobilising the Dutch water sector around a specific international water initiative and the role for FMO is to develop and structure that specific initiative in such a way that it becomes attractive for different financial partners. KWR, water companies and Vewin have taken the initiative for a joint research program ‘Water in the Circular Economy’ (WiCE). The transition to a circular economy is necessary and the water sector wants to take a leading role in this transition. By developing and applying knowledge with other actors in and around the urban water cycle, they contribute to a circular society. The first WiCE projects will start in January 2018. In these projects parties in and around the urban water cycle connect to develop knowledge on local (re)use of freshwater, the role of water in balancing energy supply and demand, raw material efficiency in the urban water cycle, and investigate governance aspects such as stakeholder management, optimal scale of innovations in the urban water cycle and cost-benefit distribution within these innovations. Project Kustplaats IJmuiden aan Zee and the city of Velsen, soon also supported by Wageningen Marine Research and Deltares, are cooperating in ‘Living with the sea’. This project aims to be an international showcase on water safety consisting of: Experimental playground – FabCityNature. Learning and testing of climate adaptation and building seaward of the dykes. BRAK! – Temporary coastal information and innovation center. To have people experiencing the impact of climate change and the innovative ways they can adapt to it. Coastal protection and living along the waterside – Building with Nature. Pilot project for living in a sustainable and safe environment. With the rising of the sea level, overcoming climate impact, and, in a natural way. Drinking water treatment yields – apart from drinking water itself – are very useable side products, including lime pellets from central softening processes and iron sludge resulting from the aeration of groundwater. Over two decades AquaMinerals has gained experience finding applications for these products in The Netherlands. The final destination of these side products ranges from paper, glass and carpet industries (lime pellets) to biogas purification (iron sludge). Research and development are key to achieve environmentally and economically viable applications. That’s the role of KWR Watercycle Research Institute. Allied Waters’ focus is to market sustainable concepts internationally, in public-private partnerships. 1 november 2017: FINISH society wins Sarphati Sanitation Award for Young Entrepreneurs. Mr Udo Kock, deputy mayor of the City of Amsterdam, handed over the Young Entrepreneurs Award to Mr Ahijit Banerji of FINISH Society during the AIWW Opening Ceremony. The award is part of the Sarphati Sanitation Awards (SSA), the biennial prize that honours the outstanding contribution of individuals and organisations to the global sanitation and public health challenge through entrepreneurship. FINISH Society was selected out of three promising initiatives. The Jury decided to award Dr Sasha Kramer who founded SOIL in 2006 for the Lifetime Achievement Award for her exemplary work to provide sustainable sanitation services in Haiti, with an approach they considered to be replicable in many other situations, especially in fast growing peri-urban areas. World Waternet, Netherlands Water Partnership and Aqua for All initiated the biennial Sarphati Sanitation Award to honour the outstanding contribution of individuals and organizations to the global sanitation and public health challenge through entre-preneurship. 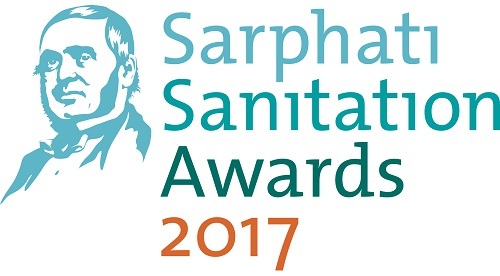 The biennial Sarphati Sanitation Award was inspired by Dr. Samuel Sarphati, a doctor who contributed to the cholera free status of the City of Amsterdam as far back as the end of the nineteenth century. He achieved this by initiating a business to collect and transport human excreta out of town and use it as fertilizer to grow crops, thus improving the health status of the fast growing population of Amsterdam. 15 oktober 2017: De Amsterdam International Water Week Conference is ‘s werelds belangrijkste conferentie op het gebied van watervraagstukken. De Amsterdam International Water Week (AIWW) 2017 zal plaatsvinden van maandag 30 oktober tot en met vrijdag 3 november 2017 in de RAI Amsterdam. Van 31 oktober tot en met 3 november 2017 wordt de 26ste editie van de Aquatech 2017 gehouden, ook in de RAI Amsterdam. Water…and nine billion people’ is the subject of the Amsterdam International Water Week Conference on Monday 30 October and Friday 1 November 2017. How do we achieve a safe, clean and sustainable water future in high-density living areas? Mr Mark Rutte, Prime Minister of the Netherlands, confirmed his contribution to the Opening Ceremony of the Amsterdam International Water Week 2017 on Monday 30 October 2017. At the Opening Ceremony, Mr Rutte will be addressing the urgency and importance of international liaising regarding the water challenges the world is facing. Not only in his capacity as a representative of a country that always has been dealing with water issues and successfully overcame many, but also as Panel Member of the UN High Level Panel on Water. The conference focusses on the ambition to achieve breakthroughs in real-life water challenges, in particular in densely populated areas: from water shortage to floods, and climate change to medication in waste water. Cities, industries and water companies have contributed issues they want to resolve. At AIWW, these will be linked to solutions by experts and innovative technologies. De sprekers tijdens de Amsterdam International Water Week Conference 2015 zijn onder andere EU-commissaris Karmanu Vella en Andrew Steer van de World Resources Institute. Daarnaast zijn er sprekers van Heineken, SAB Miller, de European Investment Bank, hetWorld Wildlife Fund, Suez Environnement en PUB Singapore. Hier een compleet overzicht van alle sprekers. De Amsterdam International Water Week 2015 zal plaatsvinden van maandag 2 tot en met vrijdag 6 november 2015 in de RAI Amsterdam. Van 3 tot en met 6 november 2015 wordt de 25st editie van de Aquatech 2015 gehouden, ook in de RAI Amsterdam. World Waternet, the Netherlands Water Partnership (NWP) and Aqua for All initiated the biennial Sarphati Sanitation Award (SSA) in 2013 to honor the outstanding contribution of individuals or organizations to the global sanitation and public health challenge through entrepreneurship. As a result of the evaluation of the 2013 process, it was decided to extend the SSA from 1 to 2 prizes, adding a Life Time Achievement in Sanitation Award next to the existing Young Entrepreneurial Sanitation Business Award. While entrepreneurship will be acknowledged by the Young Entrepreneurial Sanitation Business, there is a range of organizations and individuals which have contributed to put Sanitation for All as a priority on national and local political, societal and business agenda’s. This second Award, for Life Time Achievement, will acknowledge the contribution of parties which have achieved a remarkable impact on the access to sanitation for people at the Base of the Pyramid. Therefore, the Sarphati Sanitation Awards of 2015 will be twofold to acknowledge different contributions to the sector: Sarphati Sanitation Award for Life Time Achievement in Sanitation and Sarphati Sanitation Award for Young Entrepreneurial Sanitation Business.